Routers, like all computer gizmos, have both hardware and software setup. After you connect the router, the next step is to configure it. Primarily, and for security reasons, the most important thing is to set an administrator password for the router. Set up the router hardware. Start up Internet Explorer or your favorite alternative web browser. The computer you’re using must be connected to the router. Type the router’s address into the web browser’s Address bar. The address looks something like http://192.168.0.1 or possibly http://10.0.0.1. The quick-start guide for the router gives you the proper address. When you’re successful, you see the router’s login screen. If you cannot connect to the router, restart your PC and try again. If necessary, log in to the router. You may have the preset administrator’s password supplied in the documentation, or maybe no password is set yet. After you’re “in” the router, you continue to use your web browser to set various options. The two most important options are: setting the administrator’s password and enabling the firewall. Change the router’s administrator password. Pick strong password. Especially for a wireless router, you don’t want to pick something obvious or easy that the hackers or neighborhood kids will guess. Ensure that the router’s firewall is active. The firewall most likely is active, but check, just in case. 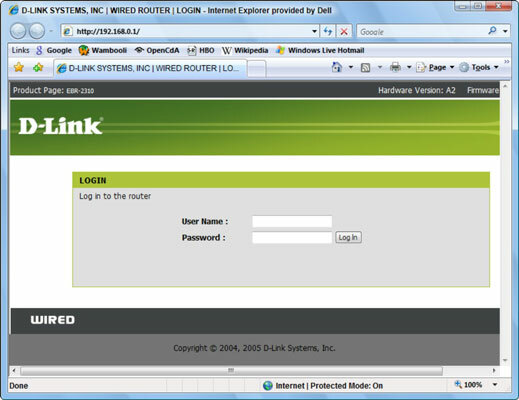 Use the router’s web-based interface in your PC’s web browser to navigate to the firewall option screen. When you’re done, close the web browser window. You may see a logout option; if so, log out before you close the window. The router remembers its settings, so there’s no need to reconfigure it after a power outage. After it’s set up, you’ll probably never need to mess with it again. You can choose Network from the Start menu or from the Address bar in any Windows Explorer window. Double-click to open the router’s icon in the Network window. By opening the router’s icon in the Network window, you immediately open a web browser window, where you can log in and begin messing with the router. Write down the router password! Do not rely on it being in a computer. You can access the router from any computer on your local network — if you log in with the proper password. If you forget the password, you can reset the router. Don’t forget to change the password on your router. When the router comes from the factory, it has a standard — and well-known — password. Immediately set a new, strong password for your router.